No matter who we are, man or woman, single or married, old or young, by the end of November we all start feeling the pressures of the holidays. Cynthia Bohnker, M.A., MFT, has developed a wonderful method to deal with stress and balance our physical, emotional and spiritual being. Overcoming Holiday Stress, will give you 32 daily encouragements to bring you through the holidays joyfully. Almost everyone (96% of us are from dysfunctional families) will benefit from her step by step concepts that she has developed as a marriage family therapist. If you are in or out of a recovery program such as Alcoholics Anonymous, you will find Overcoming Holiday Stress a useful supplement. If you are a Christian, not into any recovery program, you are going to be delighted with its 32 step-by-step daily encouragements leading up to and through New Year’s Day. "Christmas brings out the CHILD in us" - was written on a Christian bookstore's gift bag. Many people say Christmas is for kids. Therapists say we all have an Inner Child. So how can the kid - the fun-loving, creative part in us - enjoy Christmas more? What did you like doing as a kid for Christmas? Creative things like designing your own Christmas cards, making gifts and decorations, baking and decorating Christmas cookies, looking at Christmas lights, attending Christmas programs, singing Christmas songs and carols? The wonder, excitement, spontaneity, innocence, child-like faith and joy of your childhood can often be recaptured by doing some of these same activities. If you're having a hard time getting in touch with your Child Within, start by observing the children in your world. If you don't have any of your own, visit the church nursery or a Sunday School class. You may want to spend time with a child, sharing your childhood Christmas activities. Many parents would love to have you borrow their children, so they can have some free time to get their Christmas shopping done! Isaiah 11;6d...and a little child shall lead them. Matthew 18:3-5 Jesus said, "I tell you the truth, unless you change and become like little children you will never enter the kingdom of heaven. Therefore, whoever humbles himself like this child is the greatest in the kingdom of heaven and whoever welcomes a little child like this in my name, welcomes me." 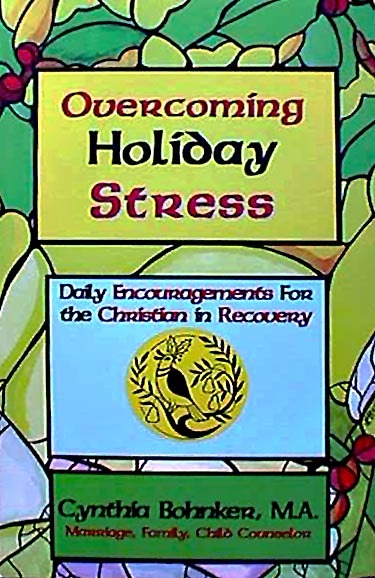 Cynthia’s Book: Overcoming Holiday Stress is available year round for holiday giving. Order today! It is a wonderful book for all ages. A great gift idea for family and friends alike. When ordering by mail, please send a check or money order for $10 for each book (includes tax, shipping and handling). For Canadian orders add $2.00 per book.